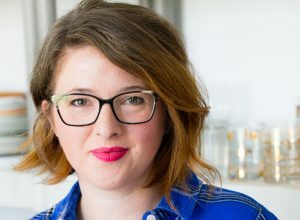 This post, Montmorency Cherry Pie 3 Ways, is sponsored on behalf of The Cherry Marketing Institute. All opinions are, as always, my own. Thank you for supporting the partners that I love and that help make Jelly Toast possible. We have had a much welcome break in our heatwave this week! A small break, but still very much welcome. I’ve been avoiding turning on my oven all summer, but this week with the slight break in heat the kids and I got to do a little bit of baking. When it comes to summer baking, I can’t think of anything that fits that category more than fruit pie. Montmorency tart cherries make the best pies. The tartness of the cherries balances out the richness of the pie crust and can be sweetened slightly with bit of sugar without becoming to cloyingly sweet. It’s the perfect balance of tart and sweet which is just about my favorite combination ever. There are no bored taste buds when tart cherries are on the table. Baking pie does not always mean a traditional pie baked in pie pan. For these Montmorency cherry pie variations, I decided to push the boundaries for what it means to bake a pie. All of these recipes are extremely simple to make and will satisfy your craving for an awesome summer tart cherry pie. 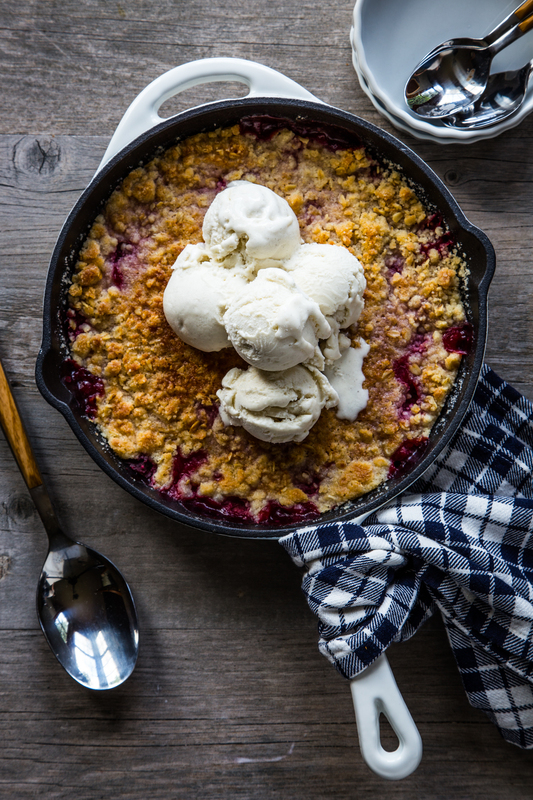 First up, we made a Montmorency Cherry Ginger Crisp baked in a cast iron skillet. This is such an easy dessert to make with frozen Montmorency tart cherries seasoned with dried ginger and orange zest for an unexpected twist. The buttery crisp topping is studded with oats to give great texture to the bubbly cherry filling. 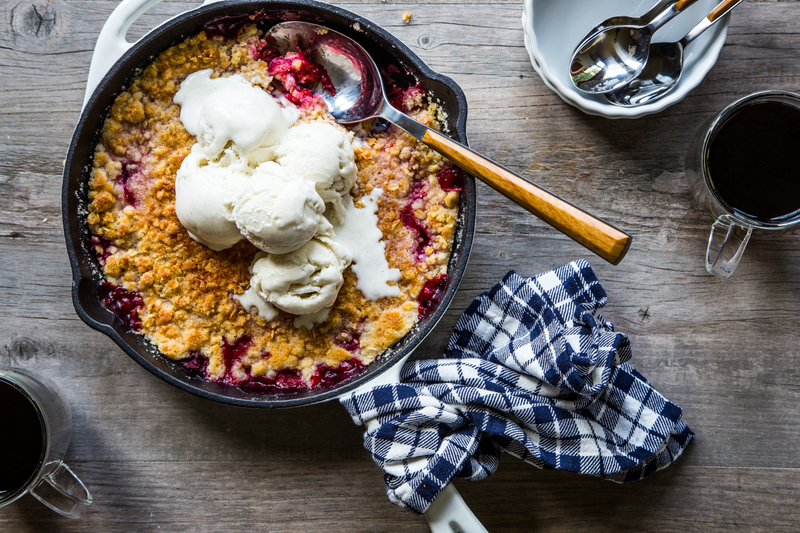 Serve this up with some ice cream and dig in! Next, we made a small batch of Montmorency Cherry Hand Pies. I took the help of store-bought pie crust, but you can definitely use a homemade pie crust if you prefer. Simply use half the pie crust recipe for four hand pies. 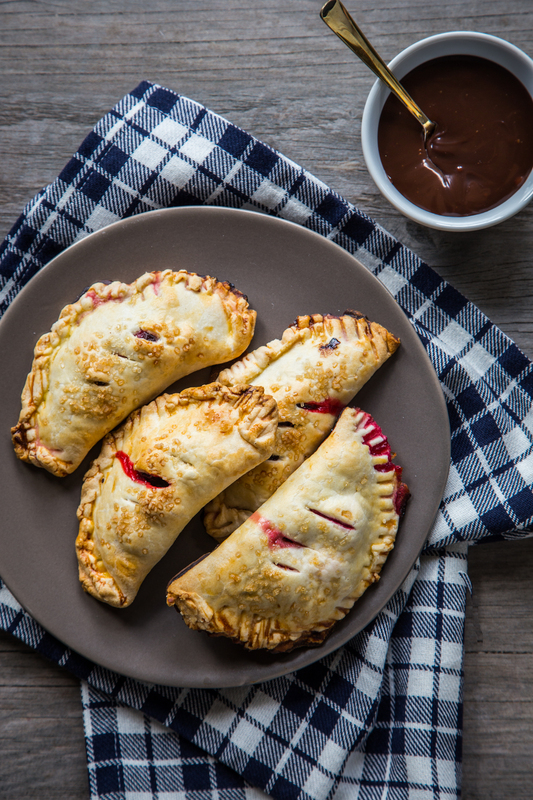 The filling for these hand pies is fairly traditional, but I added some dried Montmorency tart cherries into the frozen and this gives a lovely chewy bite to the filling of these hand pies. To take things a bit over the top, we served these up with some warm chocolate sauce for dipping. 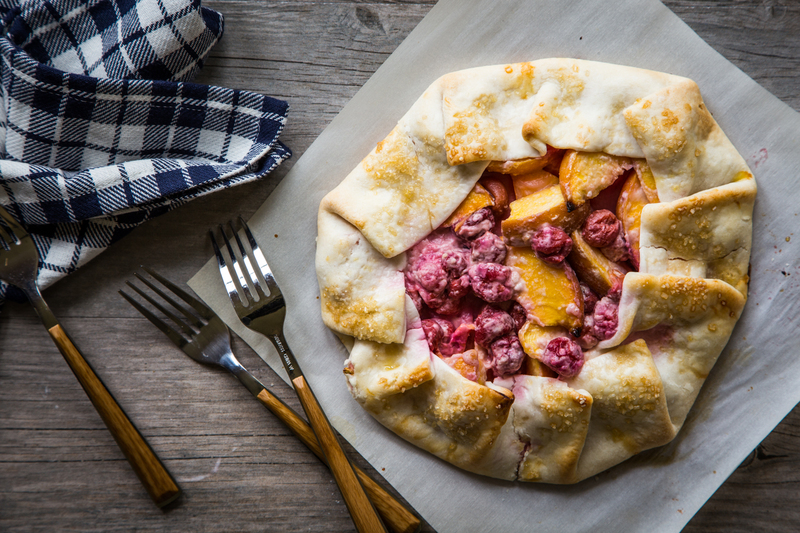 Last, but certainly not least, we baked up a Montmorency Cherry Peach Galette. If you’ve never heard of a galette, it’s simply a free form pie with a folded crust baked on a baking sheet. So simple and elegant at the same time. Because Montmorency tart cherries are stone fruits, I thought I’d pair them with another favorite stone fruit of mine: peaches! One sliced peach gets mixed with some frozen tart cherries making this filling a festival of textures and flavors. I hate to pick favorites, but this might be mine. So, if you experience a slight break in heat, go ahead and bake up your favorite version of a tart cherry pie! For more amazing summer recipes using Montmorency Tart Cherries, visit ChooseCherries.com. In a large bowl, mix together Montmorency Tart Cherries, 1/2 cup flour, 2 Tablespoons cane sugar, orange zest, and dried ginger. Set aside. Grease inside of 10 inch oven proof skillet with butter. Pour cherry mixture into skillet and spread into an even layer. Set aside. In a medium size bowl, mix together 1 cup all purpose flour, 3/4 cup cane sugar, and 1/3 cup rolled oats with a spoon. Use a pastry blender or two knives to mix butter into the flour mixture until butter is evenly incorporated and mixture resembles a course crumb. Spread topping evenly over cherries. Bake for 35-40 minutes or until topping is golden brown and cherries are bubbling. Serve crisp warm or room temperature with vanilla ice cream if desired. Preheat oven to 450°F. Line a baking sheet with parchment paper or silicone baking mat. Set aside. In a medium size bowl, mix together frozen Montmorency Tart Cherries, dried Montmorency Tart Cherries, cane sugar, and corn starch. Set aside. Unroll pie crust and cut into 4 - 4inch circles. Place pie crust circles onto prepared baking sheet. Divide cherry mixture evenly among the centered of the pie crust circles. Carefully fold over the circles forming half circles. Use fingers or a fork to crimp edges closed. Beat egg and water together and brush on the tops of each hand pie. Sprinkle with turbinado sugar. Using a paring knife, slice 3 small slits in the top of each pie. Bake pies for 15 minutes or until golden brown. Serve with chocolate sauce for dipping, if desired. 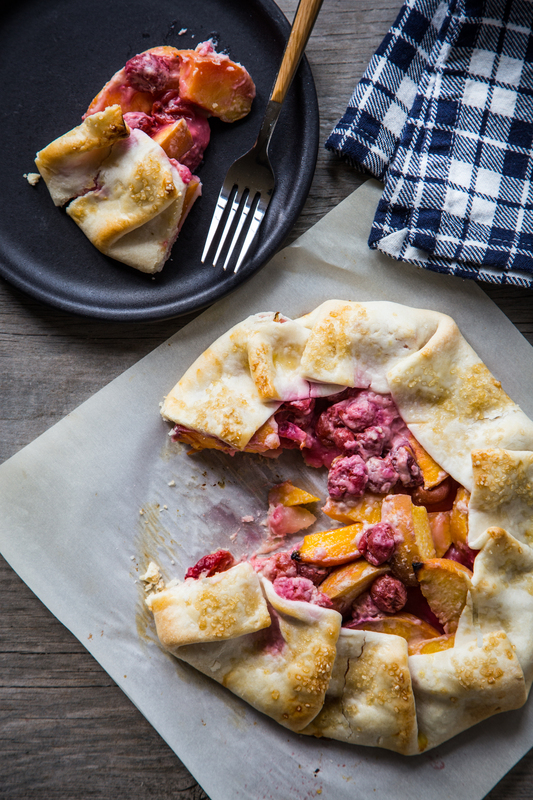 In a large bowl, mix together Montmorency Tart Cherries, peach slices, flour, and cane sugar. Spread pie crust out onto prepared baking sheet and pour fruit mixture into the center, leaving a 3 inch border around the outside of the pie crust. Fold edges of pie crust up and around the fruit, leaving the center open so the fruit is visible. Mix egg and water together and brush mixture onto pie crust then sprinkle with turbinado sugar. Bake galette for 15 minutes or until fruit is bubbling and crust is golden brown. Allow to cool before cutting and serving.